You’ve seen them both. They look very similar. But there’s one very obvious difference between the two- the contours cost a little less than the fitteds. Why? What’s the difference between the two? Who uses a contour? Today, we’re going to answer those questions using Tiny Tush’s contour and fitted diapers as our examples. First, the contour. 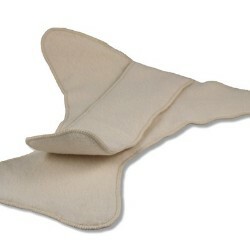 Tiny Tush’s contour diaper is shaped to fit your baby as opposed to a prefold that you have to fold to fit your baby. It’s made with organic cotton and has extra layers in the “wet zone.” Because everything is loose and not completely sewn down all around, the contour dries up fast. It comes in two sizes, size one from 5-15lb and size 2 from 15-30lb, so it’s not one-size but they’ll still last a long time. One downside to the contour diaper is that you may still want to use some sort of closure for it (either a Snappi or pins) though you could also simply hold it in place with your diaper cover since it does require the use of a cover anyway. Finally, it’s a lot trimmer than a prefold while coming in a little cheaper than a fitted. 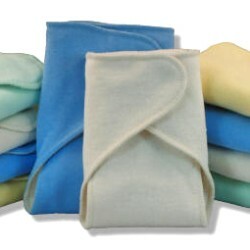 At just $8.06 (on sale right now at WLC), it’s a great, economical alternative to fitted diapers. The fitted diaper is so named because it “fits” to your baby. It has elastic in the legs and either aplix or snaps for a closure while the contour does not. This means that on rashy days when baby’s bottom needs to breath or just days at home where you’d like to go coverless, you can (keep in mind that compression leaks will happen if you don’t use a cover). Tiny Tush’s fitted is also made from 100% cotton. It is a one-size fitted, adjustable for a newborn through a 35-lb toddler so it’s great for parents with several children in diapers and also a great purchase for anyone looking to buy just one stash. 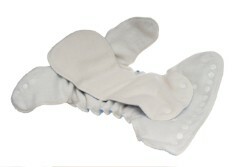 Many fitteds have a pocket opening to add absorption or several sewn-in layers that make the diaper take longer to dry. However, Tiny Tush has a snap-in liner for the inside of their diaper so there’s no stuffing and no longer drying times. But one of my favorite things about Tiny Tush’s fitteds is the price. So many of the fitteds I see these days cost close to or more than a pocket diaper. In my mind (and I know not everyone agrees with me here), a fitted should cost less since it still requires a cover. This one is only $11.95-13.95! It’s probably the cheapest one-size fitted I’ve found yet.